This is only for Filipinos who are married to Koreans though as they have F-6 visa that allows them to work at any job. Remember that Korea is still not granting E-2 (foreign language teaching visa) visas to Filipinos. You will need a resume in English and Korean. A proper ID photo. A diploma and every certificate of training that you have. The diploma should be sealed by the Embassy. A police clearance. A copy of your ARC and passport. 1. Try online websites. However, we Filipinos are not considered “native English speakers” so if you find a job specifically looking for NSETs better be prepared to be rejected if you send them a resume. Honestly, the only websites where I posted my resume are ESL Korea and í›ˆìž¥ë§ˆì„. I don’t remember ever applying directly to employers on both sites. Instead, I got calls for interviews. The Korean government site WORK is also helpful when looking for jobs in other fields. 2. Referrals. Tell people you know that you’re looking for a job. Just make sure you have a good relationship with them or they might think you owe them for life. A friend told me about a job opening and I called the hagwon and got the job. When I thanked her, she said she didn’t do anything. I understand her reaction because she’s a really good friend. 3. Welfare Centers or Village Offices. Your village office or welfare centers in your district accept resumes and they could refer you to employers, too. Give them a visit. Some welfare centers also have teachers training programs. 4. Online teaching. Another option is to do online teaching. This could be done by phone or through the internet. When I did phone teaching more than seven years ago, the rate was 60,000 won per student for a 10/minute a day and 20 days a month session. The company reimbursed the phone bill every month. I had a maximum of 32 students and worked for about six hours a day. I don’t know the rates now but what I know is that a lot of phone teaching companies are outsourcing their teachers from the Philippines. You might also want to check http://www.ontue.com to find students. I am not in any way connected with that company, I just heard about it. 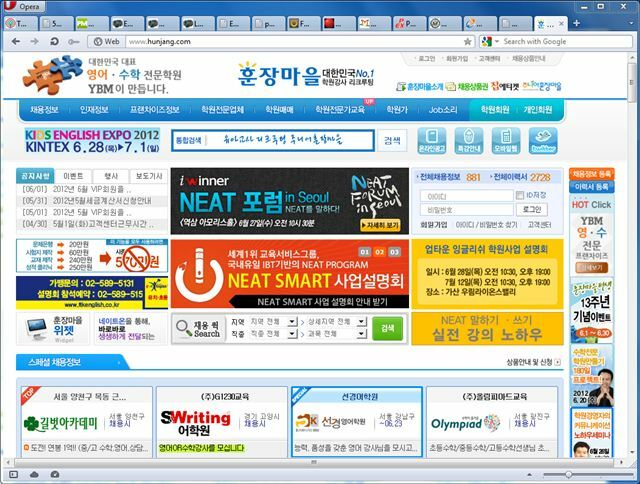 To find a phone teaching company, just type í°ì˜ì–´ on your favorite Korean portal site. 5. ê³µë¶€ë°© or private tutoring. Have yourself registered at the tax office and the education office so you could legally offer private tutorials at the convenience of your home. For a ê³µë¶€ë°©, the maximum number of students is 9. You could post advertisements at your apartment complex with the permission of your ê´€ë¦¬ì‚¬ë¬´ì†Œ or apartment management office. Read my entry on “kongbu bang” or private tutoring for more info. 6. Visiting Teacher. I wouldn’t recommend this as it doesn’t pay well and it could be tiring if you don’t have your own car. You might also have to work long hours. Companies like “Noon Nop-i”, Kumon, and Woongjin accepts Filipino employees. How much can you earn from teaching? That really depends. Remember that the minimum wage in Korea is 4,580 won per hour. You should know how much your service is worth. Don’t accept a 20,000 won job if you think you deserve more. Don’t ever ask for 50,000 won per hour if you can’t offer a 50,000 won service! Just remember to negotiate! Franchised hagwons pay well, at least based on my experience. You can get paid 30-50,000 won per hour for part-time work, or 2 to 3 million won for a full-time job. If you work full-time, you should get your health, pension and employment insurances plus a bonus after a year of work. You should also pay taxes ;p Depending on your hagwon, your job will include making evaluation reports and even ìƒë‹´ or parents counselling. Personally, it is less stressful to teach at a hagwon than to do private tutoring. That’s just my opinion based on my experience. At the franchised hagwon I worked for, we had books ready for use plus teacher’s books that I used for reference. We also had flash cards, posters and games so I didn’t have to prepare materials for my classes. At the hagwon I’m working for now, I have my own computer and printer plus a big flat-screen TV that I use for my presentations. What I don’t like about teaching at a hagwon is that it’s difficult to ask for a vacation. The hagwon has a prepared schedule for the year so you get a vacation based on their schedule. Also, the schedule is a little late if you have a child. My full-time job started at 2PM to 8PM but I had to be at the hagwon at 1PM for a total of seven hours. I felt so guilty during that time that I was working full-time. I quit after more than two years for a vacation. When I came back, my wonjangnim offered me my former job. I had to decline though. In general, a lot of the kids at a hagwon are there not because they want to be there. At my former hagwon, the maximum number of students in a class is eight. They are grouped depending on their proficiency so I could pace the class accordingly. I could recommend to my wonjangnim how long we could finish a book. At my current hagwon, the students are grouped based on their age so their levels are all different. And the only thing they want to do is to play games! I need to balance satisfying the parents’ requirement of answering the whole book, making sure they learn something and playing! Students are excited whenever I tell them that we are playing a game (that should be related to the lesson). However, they would say that the game is “boring” when they are losing. Prepare to ignore the sore losers or encourage them by saying there is always a next time. Sometimes, it is also helpful to know about the background of your students so you could deal with them better. Also, learn about the things they like. I could get a lot of my girls talking when the topic is about music and Kpop. The boys lose their inhibitions about speaking when the topic is about computer games. Both girls and boys will loosen up when we talk about animation! There will always be students who would not cooperate. Always be firm since you’re the teacher and they have to follow you. Never ever hit them nor say bad words in front of your students. Tell your wonjangnim about problem students or call their parents. When I had to make evaluation sheets, I made it a point to be careful with my words. No parent would want to know that their child is doing badly, but always be honest. Write about the child’s good point and what he/she needs to improve on. Many students have asked me where I’m from. It’s a good thing that I never had to lie about my nationality. I always tell them I’m from the Philippines and that when I was younger, I couldn’t speak English. I had some students who would even ask me to teach them a few Tagalog words! Not every wonjangnim is like the ones I’ve had. I know a few people whose bosses would ask them to lie about their nationality. Oh, don’t expect the students to speak English outside the classroom. I work mostly with Korean English teachers and they speak to the students in Korean all the time! Some would even conduct their classes in Korean! It’s quite frustrating when your job is to make them talk in English. Remember that most of the things here are based on my experience. I don’t have a lot of experience teaching adults except for two people I tutored years ago and when I did phone teaching. I also don’t have an experience teaching preschoolers. I heard it’s fun but it requires a lot of preparation. I prefer to teach elementary and middle school students. It’s a lot more fun and personally more fulfilling. Others might have a different experience from me. Would you care to share yours? indeed ate, i actually got my first job thru the government job center in incheon… i went there twice, the first time i registered my resume in 2008 and when i was looking for a job in 2010. they also provide the job seeker with a list of academies looking for Filipina teachers within the area/city..
they (the Filipinas) should go straight to the counters for the locals/Koreans, not for the foreigner/eps visa holders.. I got the job through referral (general manager of a bank â€“ one of the sponsors of the cultural center in our area). I handled kindergarten to elementary students. I was very happy at first. I even pledged to myself that I will give my best to keep my job for a very, very long time. But I found it hard to stay in my job because of my â€œstressfulâ€ relationship with my wonjangnim. My wonjangnim has been teaching English for 7 years. But sheâ€™s been doing this in Korean language. She wanted the kids to receive English Language lessons wherein the medium of instruction is English. Besides, wonjangnim found the intermediate level of the grammar lesson difficult thatâ€™s why she hired me. But I was having trouble working with her. Wonjangnim gives me SUDDEN instructions IN FRONT of the class in Korean language (she knew Iâ€˜m not good in Korean yet laloâ€™t less than two years pa lang ako dito but she still decided to hire me). She has developed a habit of interrupting my class without even excusing herself. She would give assignments and collect them and would scold the students right in front of me if they didnâ€™t do the homework she gave (as if hindi ako nage-exist). One time, I was playing the CD to the students when Wonjangnim suddenly interrupted and told me that that activity was meant for the kids to do at home. Instead, she gave me a book and asked me to do the lecture on a new topic to the other class (na dapat siya ang gagawa kasi hindi pa niya tapos yung book na â€˜yun. Iha-handle ko lamang yung class kapag yung bagong book na ang idi-discuss. Yun ang napagkasunduan namin). Although I know the topic, iba pa rin syempre ang flow ng discussion kapag pinaghandaan. Yes, only Wonjangnim knows her plan, she assigns tasks impromptu, she speaks to me in Korean at sa harap pa mismo ng mga estuydante (tanga kaya sa kanila kapag hindi nkakaintindi ng kanilang salita). The worst thing I had was when my wonjangnim corrected me in front of the class. The lesson was about Tag Questions. I was explaining Auxiliary Verbs (when does it function as helping verb and main verb) when wonjangnim suddenly came inside the room, erased a letter of what I wrote on the board and told me that I shouldnâ€™t be doing the Unit 4 lesson (which was about Modal Auxiliaries). So I explained to Wonjangnim that all the verbs covered from Unit 1 to Unit 4 are all auxiliary verbs ^^. So the kids laughed at her and said, â€œWonjangnimdo mola!â€ When we talked about it in her office, she (wonjangnim) reasoned out that itâ€™s because it didnâ€™t match her lecture. I felt that there was a silent competition going on na parang ang dating is that she is still preferred over me by the students as their English teacher. For this, I decided to quit kahit maganda sana ang location (walking distance lang mula sa amin) at pay (higher daw kasi kesa ibang katulad kong nagsisimula pa according to my friends). It was so sayang kaya lang hindi na ako happy. I gave her my resignation letter twice. Noong first time, she herself guessed that maybe it was because of her. So nag sorry siya at ang sabi ay huwag ko na lang daw i-MISINTERPRET ang kilos niya kasi stressed lang daw siya. Though walang kinalaman sa STRESS niya ang mga nakaka-trouble sa akin, I gave it a try ulet. Baka â€˜kako mag-improve this time. Pero no changes at all. Ganoon nga siguro management style niya. Since Iâ€™m not comfortable with it, nagbigay ulet ako ng resignation. So ngayon balik aral na lang muna ulet ng Korean Language ^^. Tingin ko din baka dahil sa language barrier kaya kami nahihirapan mag-trabaho sa isa’t isa ^^. hello im lizzy. Bago lang ako dito. 1 month ago. Nag aantay ako makapag start ng school cultural center. Nag hahanap lang ako ng freind .bagk lang kasi ako ditk. Wala pa ako kakilala.. I got my job at an international franchise company for adult learners of English by sending an email with my resume and cover letter directly to the National Recruiting Manager. Things were quick after that – after he read my resume and arranged an interview, I complied, and soon got the job offer. I wouldn’t have known about the company if I hadn’t asked my foreign friends about their workplaces (so yes, asking around for tips REALLY helps, but don’t expect you friends to get the job for you!). I had big dreams, and I was focused on getting a university teaching job at first. When things didn’t work out, I finally opened my mind to the possibility of working at a hagwon, and I am really happy where I am right now. I teach full-time (6hours/day); and never have to deny that I’m from the Philippines. Teaching adults is very different from teaching kids. The “behavior problems” I am confronted with comes from arrogance or prejudice on the part of the adult students who have already spent so many years studying English, and all they want is to “refresh” what they think they already know. They look at me, so Asian and so young, and they instantly have doubts about my English proficiency or teaching abilities. How do I deal with them? I put in a lot of confidence and power in my speaking. I show them that I’m proud of where I’m from, and that there’s still a lot of expressions they can learn despite their years of study. I listen to their stories and show interest in them. I value them, just as much as I want them to respect me. I would like to have a speaking teacher for elementary school students. please contact me. very helpful to those looking for a job in korea. Sadya po bang english teacher madalas work ng pinay jan? Hello miss betchay! I’m looking for a job here in busan. I applied for most online school but they are looking for NES. Could you help me? What should i do to find any sites who accept filipino applicant to teach english? I hope you can help me. Thank you! hello Ms. Betchay. I’m Ivy. would it be possible for you to share the contact details (even just an e-mail address where i can send my resume to) of your previous employer? i’m trying to look for a teaching job here in korea since March but almost all hagwons prefer white people. perhaps, if my resume could just get through to your previous employer, there might be a chance for them to at least read and consider it for they have experienced working with a filipina teacher like you. Hi Ivy! Two Filipinas replaced me at previous workplaces. If you want to apply directly at a private academy, send your resume to any GnB, Talking Club, Yoon’s English Forest and YBM Engloo. They accept Filipina English teachers and most of them pay well. Hi Ms. Betchay~ Thanks for the info. Im currently here in Korea. how much po ba usually ang offer nila sa mga pinoy teachers? Thank you! thank you so much ms. betchay! i’ll send my resume to the ones you have suggested right away! more power to your blog and to you!! !